Location: Set in the remains of the formerly more extensive gardens, reached by a drive from a road created to serve the late C20 surrounding housing. development. Built 1885-9 by E Bruce Vaughan of Cardiff, who was also the diocesan architect, for Richard Allen of Spillers at a cost of c £15000. House originally known as Ty-to-Maen and on the site of a farm which shows as a substantial complex on OS map c 1880. Sir William Edgar Nicholls, manager of Spillers, was the subsequent owner who 'presented the mansion and estate to the Cardiff Royal Infirmary for use as a convalescent home as a memorial to the late Mr Richard Allen who built the mansion and lived here for many years and in memory of the donor's long association with the city of Cardiff. 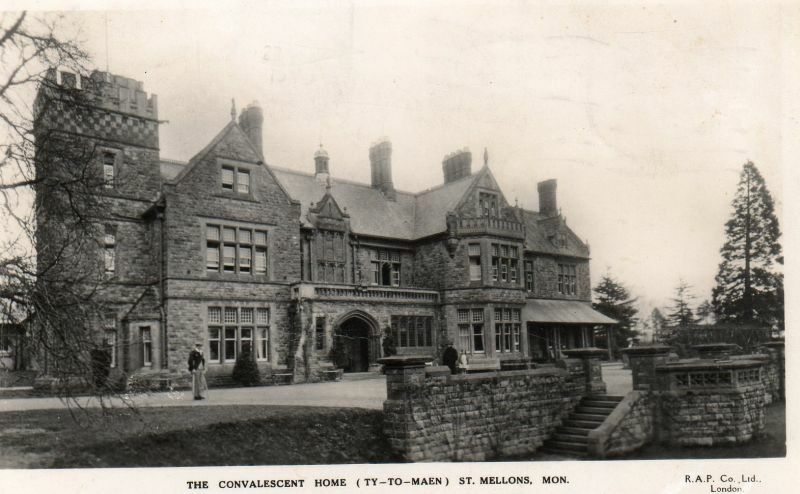 It was formerly opened by Lady Nicholls on 24th April 1926.' (dedication plaque). A second plaque records a gift by Peter Nicholls in accordance with his father's wishes in 1948. Photos of convalescent home in use (1964) show a deep verandah stretching across right bay of frontage. Main interior rooms including reception hall and staircase were decorated by Campbell Smith of London, who also provided the stained glass, with stone carvings by William Clarke of Llandaff, very likely influenced by the work of William Burges at Castell Coch and Cardiff Castle. Mansion in Tudor/Gothic Revival style. Built mostly of snecked rock-faced stone with Bathstone dressings; mostly small slate roof with gable finials, terracotta ridge tiles, small octagonal painted metal domed-roof lantern with finial and clustered polygonal brick stacks astride the ridge. Two storeys and attics. Mullion and transom windows, most with small panes in the upper lights; the entrance bay in stronger C16 style has lights with trefoil heads. Hoppers dated 1885. Main frontage of 5 bays. From left: 3 storey tower with embattled parapet, corbel table and gargoyles, chequered band of ashlar and brick, string courses, narrow single-light rectangular windows with moulded surrounds including hoods at upper level and blind trefoil-headed tracery incorporating shields; in the angle between tower and 2nd bay is a single storey, pitched stone-roofed bay window. Second and fourth bays have gables and project: second bay has a 2-light window on second floor and 4-light windows on first and ground floors. Third bay is the entrance: on first floor to left a single light window recessed behind a rectangular opening with transom and trefoil-headed tracery below; central 6-light Gothic-style staircase window comprising 2 tiers of 3 trefoil-headed lights under a small ornamental pediment incorporating a bas-relief depicting dragons; a 3-light cross window to right incorporating the same trefoil-headed moulding to centre light. Ground floor has a porch with arcaded parapet doubling as first floor balcony front; deeply moulded arch to porch with ball flower and foliage ornament and hoodmould with face stops, twin columns; to right a 5 trefoil-headed light window, single light to left. Porch interior is of decoratively banded rock-faced stone and ashlar and has a 3 trefoil-headed light window under a wide arch with foliage mouldings and unusual knot stops; main entrance doorway is to right, pointed arched and enriched with foliage mouldings and a tympanum with a relief figure of an angel with Latin scroll 'Ingredientibus pax et exeuntibus'. Fourth bay of frontage with gable has a 3-light attic window with blind tracery and a 2-storey canted bay window with panelled embattled parapet. Fifth bay at end right has 2 elaborate gabled dormers with crocketed finials and double lights flanked by pinnacles, two 3-light first floor windows and a ground floor 3-light shallow bay window flanked by single light openings, one incorporating a narrow doorway. Side elevation to right has two gables, that at end left dominated by a wide external stack of brick and stone rising from an offset above a 5-light canted bay window with steep-pitched ashlar roof; that to right has a projecting 2-storey 4-light canted bay similar to frontage with deep parapet and paired attic lights above; between is a long narrow staircase window of 2 cusped lights with quatrefoil tracery, the upper and lower sections separated by blind tracery panels; at end right is a lower 2-storey brick bay with 2-window range surmounted by a turret similar to the upper storeys of the tower on frontage but with plainer battlements and corbels; adjoining stepped down single-window range bay at extreme end. The rear elevation is almost entirely of brick and utilitarian. Attached to side nearest stables is Honeysuckle Cottage, a single storey 3-bay range with end cross gables and 4 and 6-pane sash windows, used formerly as servants quarters to the house, now a dwelling, and probably a survivor of the previous building complex on this site. In spite of institutional use, much of the rich interior fitting survives. Plan is of a large central reception hall and formal staircase with corridor to rear off which lead the main reception rooms facing front and side, with acces to a rear service corridor. Many rooms have decorative plasterwork, large ornate fireplaces and dark stained heavily moulded woodwork; door surrounds have reed mouldings and friezes, 6-panelled doors, some enriched with carved panels; outer doors are chunky variants of the plank and batten type, some in grid form, with full width iron hinges; service hatches to rooms also moulded with quatrefoils and linenfold, decorative hinges; plentiful stained glass mostly depicting naturalistic flowers and birds. Entrance lobby is very richly decorated, with stained glass to the main window and opposite a wide basket-arched screen incorporating 22 separate lights glazed with stained glass - the two at centre, the entrance doorway, replaced; archways are moulded and there is a carved tympanum to both inner and outer faces of the main entrance doorway. Main entrance hall has a pointed-arched 3-bay arcade to stairs enriched with ballflower and face stops, marble columns, coffered ceiling with friezes below. Richly moulded open well Jacobean-style staircase rises through central arch, elaborate newel posts incorporate griffins holding shields with monograms, gothic moulding to balusters, staircase wall of deeply moulded small panels; boarded ceiling with reeded joists, corbels in the form of grotesques, strapwork frieze; fine stained glass staircase window with floral motifs. Room at tower end has Neo-classical style white marble fireplace with egg and dart motif and lions with drapes, very deep ceiling frieze of Adam-style motifs with vine moulding to the cornice, coffered ceiling with metal roses/ventilators; arched recesses to tower with beast stops to hoodmould and pineapple and vine mouldings. On the other side of the hall the reception room now a music room has a coffered plaster ceiling, large fireplace with deep hood with Welsh inscription in Gothic lettering and ogee arch. Similar smaller fireplace with deep hood and ogee arch to other reception room. At end of corridor to side of second staircse is a room with beamed ceiling supported on corbels; huge Tudor-arched fireplace with deep hood enriched with bands of moulding, shallow niches to sides; narrow tiles to fireplace floor in green and black and to back in a chevron pattern of red, orange and green; dado. Adjacent staircase is of dark stained wood with exceptionally deep handrail; stained glass to window. Corridor has coffered ceiling, decorative plasterwork, gothic arches. Some similar features to first floor rooms and corridor. Listed II* as the chef- d'ouvre of an important later C19 Welsh architect, especially for its decorative elements. Group value with the former stables and terrace. In front of the main frontage and incorporating steps to the lawn at lower level. Situated by the road at the entrance to a drive which leads uphill to church, churchyard and other buildings including Church Lodge and other dwellings. Obliquely facing the main throughfare and opposite the Bluebell Inn PH.